Today, two things are significantly different. Firstly, the general populace is far more familiar with broad scientific concepts than their forbears from the 1600’s. Subservience to religious books has been trumped by irrefutable evidence from anthropologists, geologists, astronomers and physicists. This is a huge leap forward. Secondly, the evidence we have is more compelling, more accurate and less open to debate, because of the highly advanced technical nature of measuring, assessment and documentation. In a way, scientific advancement has become self-substantiating. 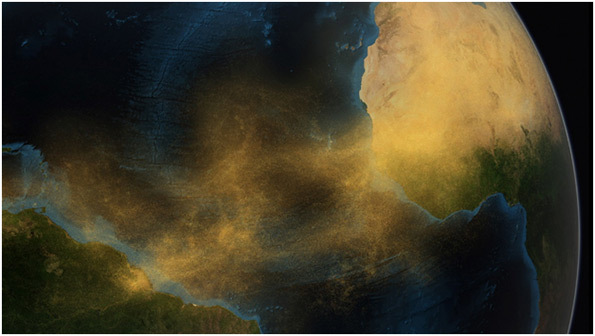 Suppose a scientist suggested that a strong wind blowing from the Saharan plains carried African desert dust high into the atmosphere and all the way across the Atlantic depositing it on the Amazon rainforest – and that far from being a damaging influence, the phosphorus contained in the mineral compounds was a vital nutrient for plant generation and oxygen production. In the pre-satellite era, the scientist might spend a lifetime trying to prove it. This claim is actually well documented and we can view the evidence courtesy of NASA and the high tech equipment aboard the Cloud-Aerosol Lidar and Infrared Pathfinder Satellite Observations (CALIPSO) satellite from 2007 to 2013. This picture plots precisely how the gathered data from CALIPSO might look. On average, out of the 182 million tons of dust that leaves the African continent each year, 27 million tons gets deposited onto the Amazon rainforest. It also demonstrates nature’s unimaginable influence over our planet and clearly emphasizes how linked our common fate might be. The Saharan dust story happens to have a happy ending, however, we are living in a time when nature is telling us many other stories. They are not so pleasant and they too, have conclusive evidence. In the face of hard-hitting facts, advanced documentation and proportionately ‘common’ knowledge why do we accept some scientific evidence as credible but completely ignore some other? There is a strange and dangerous statistic out there. 97% of world scientists agree that climate change is brutally affecting the surface of our planet – and that humans are largely responsible for its severity and acceleration. Yet, as much as 48% of the population – at least in the United States –- claim the science is unsubstantiated, bogus or a political ploy. I can’t help but point out that 46% of the same population believe that Stephen Hawking, George Ellis and Roger Penrose are wrong about their life’s work. That great advances in astrophysics that have brought us closer to understanding the origins of the universe are bogus science as well. The objection – I’m sure – is that the science goes against religious beliefs. We must have regressed as a society if we can’t remember Georges Lemaître who first arrived at the ‘single point of origin’ for the universe in 1927 with his ‘Cosmic Egg’ theory. He didn’t have any problems holding his scientific beliefs, which he considered to be neutral, at the same time as being a catholic priest. He was made a ‘monsignor’ and was celebrated for his opinions at the Second Vatican Council. So, it begs the question, is it safer to trust the scientists or safer to trust an opinion poll? Since we all have a stake in basic survival, if not for us then for future generations, perhaps the climate change political football should be taken out of play and we should be sharing information instead of polling to confirm politically held opinions. So, I’m writing this blog as my small effort on the climate change conversation. 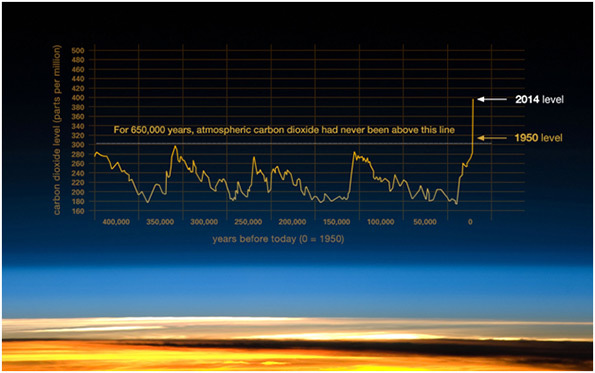 We have all, by now, seen the graph below of the cyclic nature of climate change. We can clearly see the seven ice ages and the tiny little blip that accounts for the medieval warming period. There are many other factors other than CO2 that are driving climate change, and though the exact temperature projections are difficult to assess – the trend is unmistakable. Presidential candidate Al Gore spent a good portion of his public professional life fighting this fight. For all the minor, sometimes justified criticisms of the documentary film ‘An Inconvenient Truth’, large scale debunking of it has failed. Here was a high profile figure drawing attention to the problems as he saw them and many scientists agree that his basic assumptions are in the right direction. The rancour of politicians and the divisive nature of American politics in the last two decades has managed to suggest that this was a party political issue. In the United States, Al Gore’s prominence ironically worked in reverse – transforming an inconvenient but reasonable assumption about the science into a questioned political posture. It may be the lasting and painful legacy of the climate change conversation that having a politician publicize the scientific data damaged its credibility and slowed down its common sense acceptance. We know by looking at ice core data that we have a reasonable record of climate and temperature stretching back at least 650,000 years. Scientists have now located a section of Antarctica where the ice could store information about the earth’s climate extending as far back as 1.5 million years, -twice as old as current data. 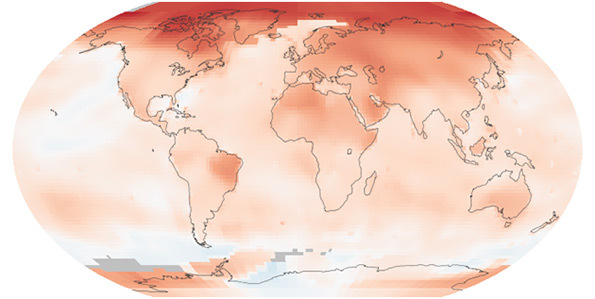 This doesn’t mean much to us if it can’t be used to emphasize the fact that 2014 was the hottest year ever recorded, beating records set between 1981 and 2012. So, it’s another reason why I’m devoting this edition of my blog to this subject. Here are some of the remarkable things from just last year. As we all know, global warming that drives climate change manifests itself in extreme weather – extreme in power and extreme in contrast, sometimes paradoxically providing very cold weather. In recent years, the North Eastern United States is experiencing the Artic Storm trend that used to dump rainfall on the West Coast. There are incidents of extreme cold, like the frozen surface of the American Falls at Niagara. Sceptics will say that this phenomenon has occurred from time to time in the past and – yes, I agree – it is not unusual for the Buffalo area to see extraordinary drops in temperature. What is remarkable about the approximately ten times that the Niagara freeze has happened since 1848, is that the last five events have been since 2007, with a double freeze in 2014. If freezing hundreds of thousands of gallons per second is not remarkable enough then surely the frequency with which it has happened during this current climate trend, must be. Early in 2014, the Melbourne region of Australia experienced severe bush fires that made the landscape look like a different planet. Severe heat caused players at the Australian Tennis Open to faint and vomit. The March to April period continued a warming in Alaska that recorded huge amounts of melt water.‡ The planet’s oceans recorded the warmest temperatures by mean average, which doesn’t look like much when you read the numbers, but drove very fierce storms and altered maps of some small islands. Tornadoes, a normal part of the US Midwestern weather system – though dropping slightly in number – greatly increased in severity and visited unusual locations bringing larger death tolls in their wake. The rest of the world was hammered with floods, mudslides, droughts, typhoons and hurricanes which in heavily populated areas took a disproportionate toll on human life. There is early but convincing evidence that climate change might influence tectonic plate activity and would explain the rash of severe earthquakes. I would have recounted these disasters in a list, but there are too many to make easy reading. Those who live in affected areas of the United States, Europe, Australia, the Indian Subcontinent, China, the Philippines, Hawaii, Chile, Japan and countless other locations-that have suffered and survived the last three years will not likely forget it. 2014 was a record breaking year, but unremarkable in that the last 15 years, all of which have broken records show a definite trend – acceleration to a world climate that may become unliveable. There are approximately 130,000 glaciers worldwide, many of them in melting retreat. It is not if – but when. In Mumbai, as some of my colleagues will attest, the land on which we live and work is reclaimed from the sea. It is not out of the realm of possibility that the sea might someday claim it back. Back home in California, the last three years of drought have been the hottest and driest in 1600 years, actually causing the land mass of California to shrink from evaporation. The now warmer ocean that runs along its coast is contributing to the drought and has seen the influx of new fish and underwater plants changing an ecology that had remained untouched for centuries. Again, NASA pictures can irrefutably show the loss of ground water – which residents thought would remain stable – leaving the land parched and dry beyond its normal capacity. The state’s agricultural hub is in flux, driving up food prices and being forced to change crop type and economic projections. In countries where agriculture is less a matter of economy and profit and more a matter of sheer survival – what will we do when it’s too late? And if we are prepared to battle fiercely and without conscience over oil and energy sources, what will it look like when we battle fiercely – and we will – over water and the right to drink it? The maps below show temperature variance. The colour white shows normal, the colour blue shows colder than normal and the colour red shows hotter than normal. Deep Blue – minus 2.5 degrees Celsius – Deep Red – plus 2.5 degrees Celsius. The warming of the Arctic Ocean is the most significant. 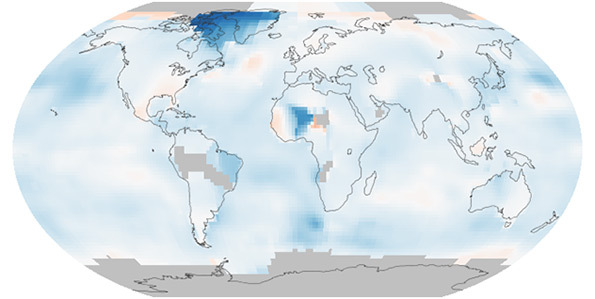 Carbon Dioxide Emissions – Map for 2014. This is not surprising given the graph shown above. Carbon Dioxide Emissions, other Greenhouse gasses and some other factors are the driving engine of the warming trend. This month a heat wave in India has claimed over 2500 lives and is the 5th deadliest heatwave in World History. Whatever the factors are, they are remarkable. I have no claim on this argument, more or less than anyone else. I have no reason to presume that this edition of my blog has anything new to say. I, most probably, wouldn’t be writing about it but this month I’m reminded that we are all ‘living inside the evidence’. If moral imperatives demand that we stand with the truth then moral imperatives might also demand that we move quickly beyond the false debate and start acting on sound advice. Using ‘science for the benefit of humanity’ does not include ignoring 97% of the scientists. All images in this edition of my blog are sourced from NASA.gov. The National Aeronautics and Space Administration provides images on a daily basis that conclusively confirm climate change data measured on the ground. Based on current levels and trends, this month NASA projected how rainfall patterns might change by the year 2100. Pictures, in this case, are worth more than a thousand words. On June 15th this month we were privileged to commemorate the 800th anniversary of the signing of Magna Carta in the year 1215. From the time that the barons confronted King John at Runnymede, ‘egged on’ by the astute churchman Archbishop Stephen Langton, there has probably been no greater moment of lasting influence on western society. However, it is possible to derail the most important things, if politics are in the mix. As we know, King John complained to Pope Innocent III who, in effect, ‘shelved’ the whole thing by late August, 1215. It wasn’t until 1300 – a good 85 years – later that much of the Great Charter was adopted into lasting law. Ensuring a better future for society should not come at the point of a sword. Nature’s Sword of Damocles hangs above us now but like Damocles we won’t be able to beg to be repositioned to safety. Innocent III’s successor, Pope Francis has ‘un-shelved’ this issue prior to the United Nations Conference on Climate Change – set for Paris this November – where all nations might arrive at a binding agreement that benefits our future. Of course, the politicians are in the mix pushing back at the encyclical Laudato si’ – within days of its promulgation. It is hoped by many that the papal spotlight might speed widespread adoption of this universal cause. In contrast to events in the 13th century, we cannot afford an 85 year delay to arrive at the right decisions. A quick note to those who think I’m wrong about all this. Since there is mounting scientific evidence that climate change will not reverse as quickly as we have brought it on, and in some measure is irreversible – I really hope I’m wrong about all this too!